A classic platinum ring, with a 1/2ct round diamond solitaire in a claw setting, with sparkling diamond set shoulders. Simply elegant, you will steal their heart forever with this delightful ring, perfect as a gift or as a token of your true love when asking that all important question. 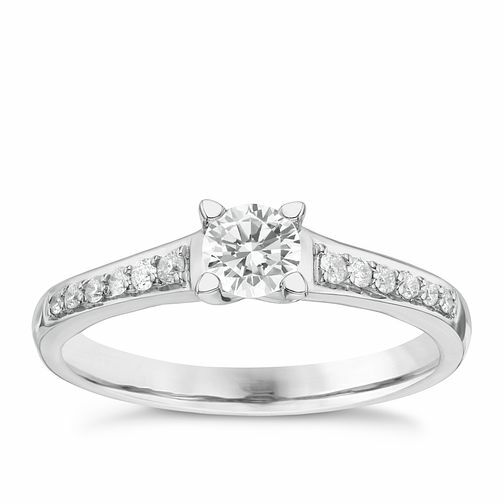 Platinum 1/2ct Diamond Solitaire Ring is rated 1.0 out of 5 by 1. Rated 1 out of 5 by Anonymous from Poor quality diamond Cancelled the on line order having viewed the ring in the shop. The diamond (which is obviously the focal point of the ring) was smaller than appeared in the picture and had minimal sparkle and poor colour. No wow factor whatsoever for a 2k ring!